* does not work on Mac OS X 10.6 (Snow Leopard) or later. please refere to Mac OS X 10.6 Snow Leopard Compatibility List. AmSetFileTypeCMX is a contextual menu plugin, which allows you to change file type, creator and file extension of selected files from the contextual menu. Changing file extension is optional. You can specify no changing file extension. 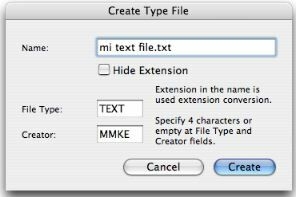 It executes changing operation using file type, creator and file extension of a file (type file) in the types folder. You just put a file at the types folder to add a new type file. It uses to make the document (to which file type, creator is not set) opened by double-clicking or to make, for example, a certain text editor document to the other text editor's one. You can set file type and/or creator of a file to none. It is not intelligent. You should change to an appropriate file type, creator and extension according to the content of the file. You cannot open the document if you change, for instance, the text document to the image file. Refer to Contextual Menu Plugins for Mac OS X how to install a plugin etc. bug fixed: folder alias ~/Library/Preferences/jp.ne.wind.miko.AmSetFileTypeCMX.filetypes not recognized. porting from CodeWarrior to Xcode and rewrite all.